"Better than the original? Yep, sure is." 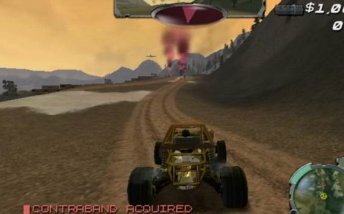 When the PlayStation 2 launched last year in Australia , one of the first titles that was available was Smuggler�s Run. Billed as an amazing revolution in racing games, Smuggler�s Run was actually a mild disappointment to many as it didn�t seem to capture the indefinable rebel element it was so obviously trying hard to do. That almost-failure, if you will, coupled with a gameplay that got real repetitive real fast, saw Smuggler�s Run quickly taken up as a rental, but not too many saw any kind of need to keep it around. 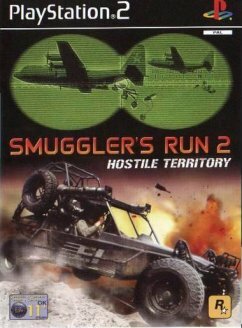 Fortunately for all of us, the developers, Angel Studios, had another go at it, and Smuggler�s Run 2: Hostile Territory was born. This game is more of the same, whilst at the same time bringing that elusive element that was missing from the first one, a sense of belonging to an outlaw gang. The FMVs, voiceovers and full story mode drawing all of the missions together seem to gel in this instalment where they didn�t connect with the gamer in the first. The FMVs merge seamlessly with the start and end of each level and provide a continuity that is sadly lacking in so many other titles. All of these parts are firmly cemented together with the gameplay itself, and provide a richer, more immersive title in which to take part in. And graphically, the game is much improved over the original too. There is no obvious pop-up, and the vehicles are all gorgeously detailed. Some of the ground textures can have a slight tiling effect when seen at a distance but it in no way detracts from the look and feel of the title. The 60fps framerate is also very impressive considering how much action can be going on at any one time, and also how far you can see. It must be noted that the first few missions are in fairly arid countryside and so may look unimaginative, but the later levels are much more impressive. The weather effects rather than being an artificial add-on, really blend with the rest of the environment. Snow, rain, rushing rivers and other moving environmental effects are ever present and add a touch of realism to the title. The standout feature in the sound department would be the cool engine sounds � each vehicle has its unique noises but they all express the grunty meat that is inherent in these types of cars. Multiplayer is enjoyable too � pick from the cars you�ve unlocked and go head to head in a race against a mate and the clock. Smash them to bits before they can try it on � the ultimate in friendly rivalry. The other letdown is that despite the added features, the improved locales and graphics, the more immersive storyline and varied mission styles, you�ll still get to a point where you realise that it�s all just more of the same thing. That point won�t happen anywhere as quickly as it did for Smuggler�s Run 1, but it will happen for most gamers. Overall, a definitely enjoyable title that�s deserving of a good go. Those who decide to go ahead and purchase will not think it a waste of money, but be aware of the feeling of sameness that can occur as you progress.